Welcome to my weekly series: Book Club Picks. 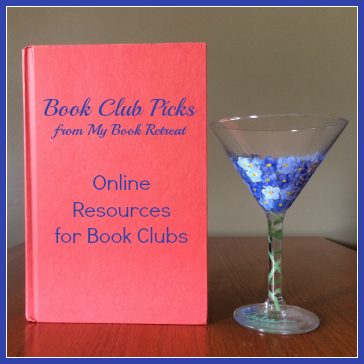 This week, I'm sharing some great online resources for book clubs. Whether you're looking for book lists, discussion questions or ideas to make your book club meeting more fun and interesting, there are online resources to help. I've put together a list of some of my go-to resources, but I'd love to hear about the blogs and websites you find helpful as well. Please leave a comment to let us know about any other resources you recommend. Reading Group Choices has a great selection of themed book lists that can help book clubs choose their next book. From Bookish Books to Canine Companions, there's bound to be a list that's right for your group. Goodreads has a Popular Book Club Books list that is a great resource for choosing books as well. Book Movement has lists of popular book club selections as well as reading group guides, giveaways, reviews and more. LitLovers provides many resources for book clubs, including a list of general questions for both fiction and nonfiction, but you can also search for discussion questions related to individual books. Reading Group Guides is another online community for book clubs where you can find book lists and discussion questions. The Book Club Cookbook is a fabulous resource for blending food and books. Get ideas about the best food and drinks to pair with the books you're reading and discussing. These Novel Noshes look great! Food in Every Country has a great list that you can use to choose recipes based on the setting of the book you're reading. What online resources does your book club use? Next week, I'll be sharing reviews of some of the books my book club has recently read. Please let me know if you have suggestions for other topics to cover, or if you would like to write a guest post for my Book Club Picks series. I'd love to hear about your book club or your favorite books for discussion! The Women's National Book Association founded National Reading Group Month (October) 8 years ago and then created the annual Great Group Reads list. The 2015 GGR list will be announced in about a month. We'd love it if you'd post about it sometime! It's great to see a blogger paying to much attention to book clubs as they're an important part of publishing.